Eaglemoss Hero Collector proudly presents the Official Star Trek Busts Collection. The iconic Captains of Starfleet and other memorable characters from over 50 years of Star Trek TV and movie history are captured in impressive detail with highly accurate likenesses, uniforms and props. 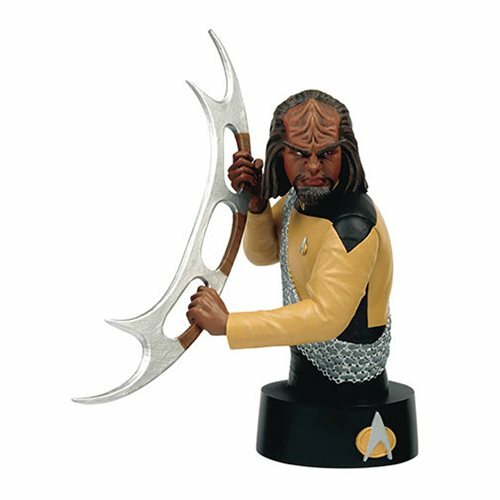 The Star Trek Bust Collection Worf with Collector Magazine #3 is a hand-painted polyresin busts roughly 5-inches tall, and comes complete with a fact-filled magazine, and form an essential addition to any Star Trek collection. Ages 14 and up.